One of the most infamous switcheroos in movie history occurred in 2002, when director Steven Spielberg released a 20th anniversary version of his E.T. The Extra-Terrestrial that replaced the government agent’s guns with walkie-talkies. That decision was not greeted with universal applause, and Spielberg eventually relented, but a mischievous Tumblr suggests that the famed filmmaker simply didn’t go far enough in his gun-removal efforts. The self-explanatory Guns Replaced With Selfie Sticks takes movie stills and posters and systematically disarms the would-be badasses depicted therein. In place of their various, blatantly phallic pistols, rifles, shot guns, and hand cannons, they’ve been given relatively harmless selfie sticks. Incidentally, that vexing invention has been around since at least the ’80s, but the rise of smartphones and social media in the new millennium has made it a universal symbol of self-absorption, replacing the hand mirror of old. Guns Replaced With Selfie Sticks suggests a gentler, less violent world in which people settle their differences not with bullets but with Instagram likes. It’s debatable whether John Wayne would have owned a selfie stick had he lived to see them, but anything is possible on Tumblr. Clint Eastwood has a weakness for selifes, too, it would seem. 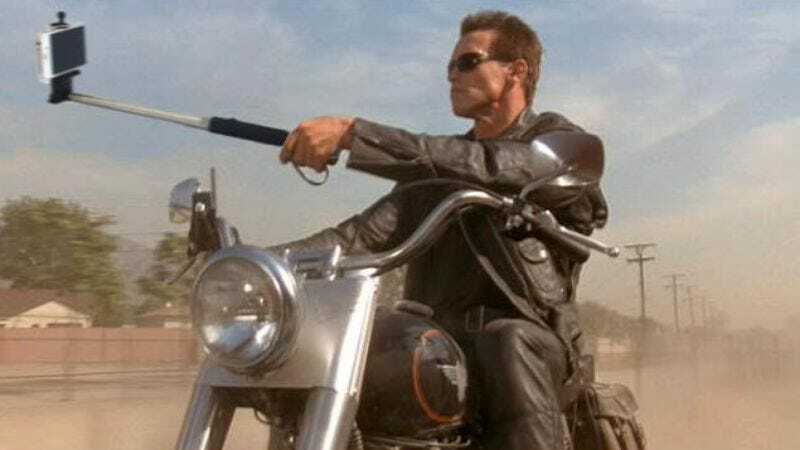 The Tumblr has only been around for a few months, so it hasn’t completely exhausted the comedic and aesthetic possibilities of replacing guns with selfie sticks. As of this writing, the blog has yet to tackle the firearm-centric James Bond franchise, which seems like a major opportunity. Imagine how surprised and grateful the British spy’s foes would be if, in the heat of battle, Bond paused to take a picture of himself looking awesome in a well-tailored tuxedo. In the meantime, the Tumblr brings a bit of levity to even the grimmest of movie scenes. Take, for instance, this tense moment from Stanley Kubrick’s Full Metal Jacket.